Iambic mode keying occurs when you squeeze dual lever paddles, and then release both paddles simultaneously. If the keyer is in mode A, it will finish sending the current element (dit or dah), and then stop. If the keyer is in mode B, it will finish sending the current element, then send another element, and stop. You can stop reading now, if you'd like. The remainder is just me prattling on. Iambic modes were a mystery when I began learning the code. My first transceiver defaulted to Mode A and I had Bencher paddles so I got used to squeeze keying a bit but only in Mode A. When I got my TenTec Eagle, its internal keyer only supported Mode B and that totally screwed me up. I didn't know what was going on and thought something was wrong with the radio. I ended up using my old HamKeyer external keyer with the TenTec Eagle rather than figure out Iambic mode B. But, as with most things in this hobby, I eventually decided I wanted to understand what the Iambic modes were about and how to use them. Iambic refers to a pattern of syllables, typically in a line of poetry. There are various "meters" that describe different syllabic patterns. Iambic is a pattern that has a short sound followed by a long sound, as in deDUM or ditDAH. If you've ever used a CW dual paddle key with an electronic keyer and squeeze the paddles you'll be greeted with ditDAH ditDAH ditDAH ditDAH ditDAH ... Aha! Iambic meter. Unless you like to practice sending Walt Whitman poems, there's not much direct relationship between ham radio and poetry. But I've read CW operators referring to Iambic "paddles" or advertising an "Iambic paddle".... Well, I'll argue there's no such thing as an Iambic paddle because a paddle by itself whether it is a single lever paddle or dual lever cannot make an Iambic pattern on it's own. 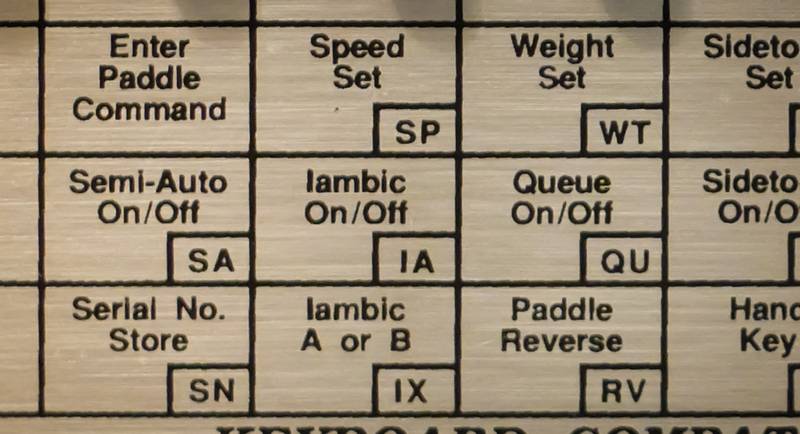 A paddle is only half a CW key, it needs a keyer, and the code in the keyer is what makes Iambic possible! 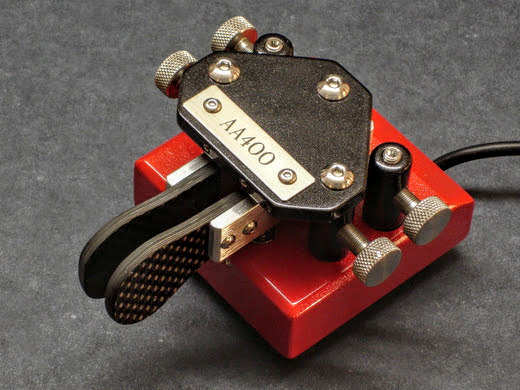 Ok, back on topic; a dual lever paddle can be used with an electronic electronic keyer, that supports Iambic mode(s). A single lever paddle when used with an electronic keyer cannot make use of Iambic mode, so called, squeeze keying modes. 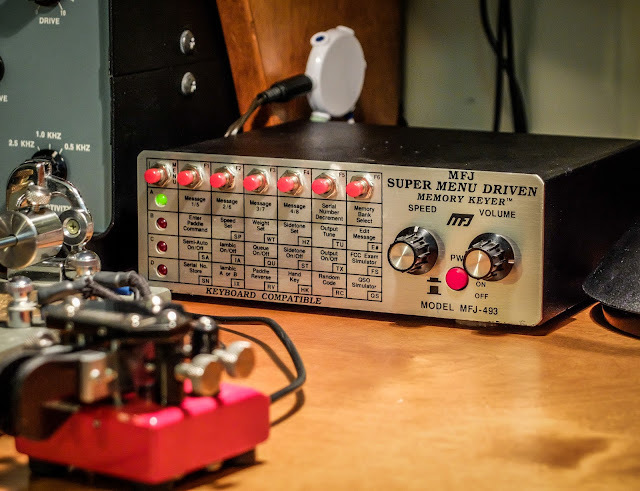 So when we talk about using a paddle with an electronic keyer for Iambic mode keying we are referring to a dual-lever paddle connected to an electronic keyer (or the electronic keyer circuit built into a transceiver). A two lever paddle is required because the Iambic modes of the keyer are employed while both levers are pressed and released at the same time. What happens when both levers are released simultaneously depends on the Mode that the keyer is using. The difference in the two modes only matters when you release both paddles simultaneously. So if you never release both paddles together, you won’t see a a difference. You can avoid interaction of either Iambic mode if you release each paddle as it finishes its final element rather than releasing them together. For example with the letter "C", DAHditDAHdit, release the DAH paddle during the final DAH, and release the dit paddle during the final dit. For a letter ending in DAH like "A", ditDAH, release the dit paddle during the final dit, and then release the DAH paddle during the final DAH. This will produce the correct code whether the keyer is in Iambic mode A or B.
Ok, I'll admit squeeze keying allows you to send kinda lazy, and it's cool when you demonstrate CW to someone how little motion you can use with paddles compared to a straight key. However, there are numerous articles out there for and against squeeze keying, and I think they both make good points but some proponents of each treat it as a somewhat religious doctrine and I just can't get that serious about it. Personally I enjoy squeeze keying when I'm sending at 20 words per minute or less because it's relaxing and is a bit nerdy to let the keyer do a dit of extra work for me now and again (see what I did there). But I start making more mistakes as the speed increases past 23 wpm and I absolutely can't squeeze-key above 27 wpm. I have trouble using a dual paddle above 25wpm because I accidentally squeeze key when I shouldn't and Iambic stuff occurs accidentally. I could likely improve with practice, but higher speeds are easier for me with my Bug or a single paddle key so I haven't really tried to speed up using dual paddles. For now it's not much of an issue because I rarely QSO above 23wpm. I only key above 25wpm when working a DX station and it's such brief bursts that I just use my bug or send my "5NN TU dit dit" using a keyer macro. In 1951 an electronic single-lever key was described1 which used 5 tubes to send self-completing dot- and dash-elements with automatic spacing between letters and words. But its continuously running time-base resulted in an uncontrollable beast so that the author himself wrote he does "not feel that any but the most feverish electronic key enthusiasts will wish to build one of these infernal, maddening machines", but nevertheless he hoped that the idea might provide an inspiration for further development. John Kaye, W6SRY, accepted that challenge and came up with a rather ingenious design which he published2 as the Ultimatickey in QST magazine in 1953 . The circuit is based on 3 tubes and 7 relays and sticks to the basic idea of a continuously running time-base, which is the only weak spot of his design: pulses from the time-base trigger the generation of dot and dash-elements, and so they do not start immediately with the closure of a key contact but only with the next pulse. By addition of dot/dash-memories he avoids dropping of leading elements and transforms the beast into a beauty: once a contact of the singlelever key has been closed, that closure is retained by a memory-relay contact parallel with the key contact and the associated dot- or dash-element is properly generated as soon as the trigger pulse arrives, even if that key contact is open again or the opposite key contact is closed by then. The dot/dash-memory relays are reset and their contacts opened by the closing contacts of the associated dot/dash-generator relays. The dot/dash-memories are independent of each other and because a dot and dash often are rapidly stored together before keying starts, a sequencing circuit retains the proper order in which the dot/dash-generators are initiated. This combination of independent dot/dash memories which not only avoid dropping of leading elements but also provide tremendous timing leeway with sequencing allows the storage not only of a single dot or dash but of a whole dot + dash or dash + dot sequence. While this initial design still used a single key lever, his next version3 which appeared in 1955 was the first twin-lever electronic keyer and ancestor of the modern squeeze-keyers which we use today, and it is this key’s action that gave the "ultimatic" mode its name. The circuit is based on 11 tubes and only one relay and the time-base, memory and sequencer are functionally identical to the first version. But because contrary to a single-lever both contacts of a twin-lever key can be closed at the same time, a seizure circuitry was added: whenever a lever makes contact, it seizes control and the subsequent elements correspond to that lever until the other lever makes contact or the lever is released. but spell and punctuate" (alluding to the characteristic "Lake Erie swing" of some bug operators). lever generates a string of dot- or dash-elements only, exactly as in ultimatic mode - but contrary to that, squeezing both levers generates a string of alternating dot- and dash-elements with the commencing element corresponding to the lever which was hit first. So basic iambic keying with self-completing dots and dashes can be generated by executing this simple set of instructions: poll both levers alternately, if the lever is pressed generate the corresponding element and continue polling. The iambic mode is most effective for characters with alternating elements. All characters of the alphabet, except for the "P" and "X", and all digits can be generated with less than three strokes. However, only the "C" needs less strokes than in ultimatic mode. extended that basic iambic logic by a dot-memory. As we already know, this feature was originally developed by W6SRY, but his very ambitious Ultimatic key did not gain too much popularity. Then it was reinvented by Dave Muir, W2YVO, who recognized the problem of dropping single embedded or final dots e.g. in letters like "K" or "G" because the operator is too quick (continuously running time-bases were outdated and hence dropping of leading elements was no more a problem) and who filled the gap between simple circuits and the Ultimatic with his Penultimatic single-lever electronic keyer described6 1962 in QST. And because it is more likely to press and release the short dot too early during the long dash than the long dash during the short dot, the first Curtis-keyer had a dot-memory only but no dash-memory exactly like the single-lever keyer by W2YVO. In 1973 John Curtis brought out the 8043 CMOS chip, the first integrated-circuit iambic keyer with dot-memory. character spacing, was published7 in QST magazine shortly after John Curtis' 8043 chip appeared. The behaviour of the Accu-keyer can be described by the basic iambic set of instructions together with the following dot/dash-memory rule: if anytime during generation of an element the alternate lever was pressed, generate an extra alternate element. So neglecting the fact that the Accu-keyer has both dot and dash-memory, the only procedural difference is that it just remembers a state "pressed" of both levers while the Curtis-keyer remembers a change of state or a transient "from unpressed to pressed" of the dotlever during the generation of an opposite element, and if that happened both keyers generate an extra alternate element. 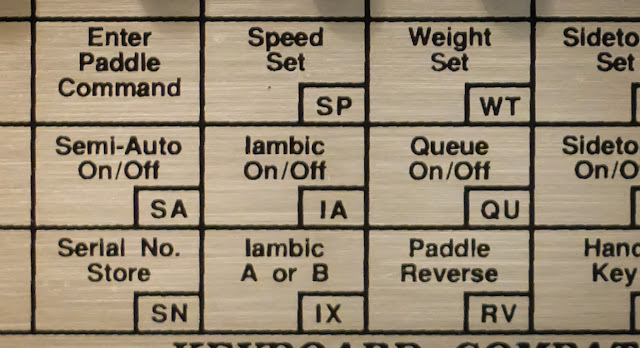 iambic type "A" and "B"
the 8044ABM chip which offered selectable "A" or "B" type of iambic keying. Please leave a comment regarding you experience with squeeze-keying.